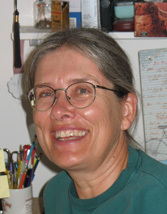 Christina Thiele has been typesetting with TeX since 1983, especially in linguistics and other non-math/science fields. She is a past president of TUG. Christina Thiele, interviewee: I was born in Ottawa (Canada). Other than several years studying and working abroad (France, Iran, Germany), I've lived here all my life. My husband's also a native Ottawan, a senior systems analyst at Carleton University, where I did my studies (linguistics), and where we met. We have a 5-year-old daughter, Anna. I began using TeX in 1983, working on linguistic journals; in 1991, I started my own company and continue to use TeX to typeset linguistics and many other non-math/science materials, still concentrating on books and journals. DW: Please tell me more about how you first became involved with TeX and its friends. CT: In 1982, I was just starting my graduate year at Carleton University (Ottawa), with a stunning 300.00 per month grant (didn't even cover rent), so I needed a job. Fast. One of the linguistic dept. profs. was about to become editor of the Canadian Journal of Linguistics (CJL), and had been convinced by his co-editor (who wrote the first version of our macros, and also designed two bitmapped IPA fonts for us, called “ph10” and “ph7”) to give the beta-version of this program called “TeX” a try. We could test them out on Bill's other editing/publishing project, the annual Papers of the Algonquian Conference, before deciding if it would also work for CJL. He needed someone to type in stuff — “et me voilà”, as they say around here. I'd never touched a computer (well, except for some non-starter hours at the Honeywell mainframe running CP-V, then CP-6) and did the roll-eyes-back-in-head thing when they said the on-switch was at the back of the box, not the front, where all self-respecting electric typewriters had 'em! We did the keyboarding (this was in 1983 — hardly anyone in linguistics had computers, and the idea of actually sending your file to someone else was simply inconceivable) on a locally manufactured Apple clone, the Peach ;-). We used a software program called “Gutenberg” (I kid you not! ), designed by a linguist down in Kingston (Ont. ), I think — it used explicit coding and there was no on-screen previewing. The files were then run through a conversion program, to change Gutenberg code (?done in LISP) into plain TeX — another program with explicit in-file coding, and no on-screen previewing. The macros for the journal were based heavily on manmac.tex, which were used to produce The TeXbook. The files would then be uploaded via 300-baud modems to the mainframe, where we'd attempt to TeX the files. My main objective was to be able to process a file through to the end. The warning and error messages spewing on the screen meant zero to me (hey, I was a linguistics grad student, not a programmer!). If I could just get the screen to read “Output written to …”, I was delighted. We'd then “proof to paper”, and after paying 10 cents per sheet (!!) for using the only printer for TeX in another building, on the other side of campus, we'd fix things. Again and again. It got expensive (we also had to pay for disc space on the mainframe, so a lot of early issues were deleted as they were published!). We'd keep all the reject pages (I had a stack that eventually was as tall as the 5-drawer filing cabinet it leaned against!) and at camera copy time, we'd pore through those sheets, looking for words to cut and paste over typos, spacing errors, and so on. Which meant, of course, that there was a second (growing) pile with one or more holes in each page. Several years later, when we moved offices, I went through that pile, and created “an historical document” of our own fumblings and stumblings, complete with annotations. Bill Cowan (now deceased, but at the time, the person who showed me what a really good editor could do for an article) laughed himself red when I showed it to him — and it still makes me smile at how primitive things can get, even when you've got TeX at your fingertips. We just didn't know enough. Eventually, we became more proficient, more knowledgeable, more “TeX-ish” in our thinking ;-) and gradually the on-screen warnings and error messages made enough sense that we could reduce the number of trees sacrificed. The mainframe eventually migrated away from the original AM fonts to the CMs; I became involved with Janene Winter's work on WSUIPA, which CJL started using in 1988. We got our own printer, so the 10-cents-a-page expense fell away. As our experience grew, other authors and editors started to come up and ask me to typeset their projects: TeX was capable of handling the stuff they wanted to edit and publish. So, starting with a job to help pay the bills while I got a degree in linguistics, that job is now full-time: I run my own company, and typeset a lot more than just linguistics. The CJL co-editor, Jean-Pierre Paillet, is probably the one who showed us a copy of TUGboat in perhaps 1985, which introduced us to TUG, which I joined in 1986. In 1987, I went to my first meeting, “sponsored” as it were by CJL, took a couple of courses, and gave a paper entitled “TeX, Linguistics, and Journal Production” for the humanities-themed meeting. I don't seem to have strayed too far from that triad ever since ;-). DW: Tell me about your contributions to TUG and TeX and what motivates them. CT: After my 1987 paper, I was asked to join the TUG board in 1988 (at the Montreal meeting) and to edit the second-ever conference proceedings. The 1987 papers were the first, compiled by Dean Guenther at WSU (Washington State University, where Janene Winter worked); Dean probably figured I was so full of piss and vinegar that I should be put to more productive work ;-). In any event, I edited the proceedings (the 1988 ones were also a TeXniques issue; after that, they became part of TUGboat) for several years, worked on numerous committees on the board (including conference organising, publications, bursary, and so on), served in the executive, and finished off my board career ;-) as president (1993–95). While president I worked on getting a production team together for TUGboat, and continue to work (very occasionally now) on the tub-prod team. I'm not a programmer or a developer; in fact, I'm not a terribly clever user of TeX. But I do like to organise things ;-). So perhaps my contribution to TUG has been more in the paperwork, in the structural. As a member of those many committees, I helped work on various documents and help files, which eventually ended up on CTAN in the TUG directory. I was editor of TTN (TeX and TUG News), our first small-scale newsletter (hardcopy was more logical at the time, just as the on-line PracTeX Journal is more suited to today's environment) for its four years (1991–95). TTN was a user-driven concept and publication, aimed at my level! Probably rather egocentric to say that … but then, how many macro packages are only written because the author needed to do something for their own purposes! In our community, we seem to balance work done for personal gain by then turning around and letting everyone else in on it ;-). I think the motivation in large part was to try and organise and present some kind of guide through the ever-expanding stream of information which was increasingly coming forth from all corners of the world. We'd moved from a user community with only one user group, TUG, to a splash of new groups in Europe (DANTE, GUTenberg, the Nordic Group, NTG, UK-TUG), which were working very hard to provide their users with user-friendly information. We all were trying to make TeX easier to understand, and to get information for users out to those very users. I think the idea of some kind of central archive was also starting to built up — again, a way of connecting macro writers with macro users. And so CTAN evolved, again in that atmosphere of trying to organise the tons of wonderful stuff for people using TeX. Wherever they were. Whatever language they spoke — or typeset in ;-). But when my involvement in the TeX community itself became significant, hmmm … I don't know. It's difficult to say that of oneself. I'd spent most of my time inside TUG, as it were … I did gradually begin to realise that other people seemed to be interested in typesetting linguistics, and that what I'd been learning over many years might be useful to others. In 1993, I started up the ling-tex list (first at George Greenwade's SHSU site in Texas; then moved to Dag Langmyr's site in Norway in 1995, I think it was), and collected info on various packages available (in lingmac.tex). In 1992/93, TUG's Technical Council had started up several Technical Working Groups; in 1994, I was asked to chair one in linguistics. The ling-tex list still exists … so, that means it's been around for 12 years! Wow …!! We've seen wonderful upgrades in fonts (TIPA, from Fukui Rei, is now almost the standard); packages seem to be very robust (I think most passed from LaTeX2.09 to LaTeX2e — now simply called LaTeX — with very little fuss); and we still see answers to questions from new users or from users new to a particular package, as well as package announcements. Most (if not all) of the package and font developers are still on the list, which really contributes to solving problems, and getting answers within a very short time. Just a great community of users. So I guess that's a significant contribution. As for why I do it — well, it's obvious! I need all the help I can get to set linguistics with TeX! So, my own self-interest is what really fuels my contributions ;-). But seriously … I think it's an awareness that I earn my living using TeX, which is free. At a certain point, it seems only right and fair to give something back freely. I didn't understand every single thing that we ran in TTN — but it provided the space for those nifty little tips and tricks to become more widely known and used. I'm not the answer-person on ling-tex — but I've provided the mechanism for those answers to flow. I would like to see TeX continue being/becoming more accessible to its current and potential users. If I can aid in that effort, then that's my contribution back for being able to do what I do. DW: What do you see as the major eras or transitions in the evolution of TeX and its friends and the driving forces? CT: I wasn't a TUG member or even using TeX during what I've since come to view as the first phase: development. That is, people who took the TeX program, ported it to different platforms and operating systems, found and fixed bugs (not just in TeX, as I understand it, but also in compilers and other stuff), wrote drivers for printers and early previewers. All that essential groundwork which is now almost unknown to new users. You have to read through the old TUGboat issues to see what I mean. The site coordinator reports were in some ways the most significant and important reasons for attending the annual meetings and for reading TUGboat. Each issue was almost like a novel, a mystery, with “this bit solved”, “that bit pending” — and, “oh my, that wasn't expected”. It's compelling, in some ways. You can see TeX spreading, advancing, improving, and surprising people along the way. And, it seems to me, that this group of people, during this stage in TeX's evolution, are the only ones who can really tell that story. Because as TeX was evolving, operating systems and computers were changing as well. What was “fast” one year became a snail's pace the next. What was massive storage and memory at this year's meeting became limited and outdated by the next. Again, this isn't an area where I know the details; but I've seen enough references to this to understand that the origins of TeX were directly affected by what was available in terms of computer technology. And if we lose that information, that awareness, misconceptions about why TeX can and cannot do certain things will begin to grow. So we need to claim our history from the horses' mouths, as it were, while we still can! I'd say the next big phase was the explosion of applications and special-purpose macros and style files (as they were then called) as exposure to TeX expanded beyond the math/science core. I've already mentioned that the 1987 TUG meeting had “TeX and the Humanities” as its theme, and there were some very interesting papers given, well removed from math ;-). Having such material come out in print probably goaded others who'd been trying to use TeX — or still considering it — for non-math/science purposes. And finding out that there might be others doing the same thing; the 1987 meeting had two different papers on typesetting Greek material … but I don't recall whether Silvio Levy and Pierre MacKay actually knew of one another's work. And so, not only were the non-math/science applications growing but the number of people involved in each of these areas was also growing. We saw lists start up for typesetting (typo-l in 1992), setting Russian (RusTeX-L in 1989), Greek (ellhnika in 1991), and so on. Earlier general lists for help with TeX were already in place by 1987: texhax in 1986, uktex and texmag in 1987. The ling-tex list was actually rather later, in Dec. 1993. A history of lists would be an interesting side project ;-). As for the main driving force, I'd have to say it was CTAN and its archivists! There were so many really great little (and big) packages proliferating — you'd read about them on texhax, or texmag, or just regular e-mail exchanges, or hear about them at meetings and such. I'd keep tons and tons of texhax mail, sorting it by topic, just to keep the references around in case I'd ever need 'em. By way of example (although I don't remember where the reference came from), I found some wonderfully easy to use Hebrew fonts at a site in Israel. Great stuff. A little later, some knotwork fonts from Ireland, also from a specific site. It was CTAN (in 1993) which made it possible for everyone to find everything. This made it possible not only to offer a home for all the wonderful stuff that had been created over the past many years, but it allowed both authors and users to comparison-shop, as it were ;-). In one place, you could find several options for doing the same or similar things — modifying headers/footers, or playing around with captions. Having everything in one place also probably prompted authors to write nice code ;-), improve their documentation, and address small bugs which a much-expanded user base now brought to light — not everyone does the same thing the same way or, more significantly, would think of combining this package with that one, thereby finding an incompatibility that needed fixing. In short, everything improved, from the packages themselves (we now see that almost all the newer ones in fact use the .dtx/.ins documentation approach), to the ways in which they combine and enhance other packages. As for how CTAN came to pass, and how it has evolved since its beginnings, that's a history lesson which the archivists themselves should be coaxed to tell. I do remember sitting at an outdoor table at the 1989 TUG meeting at Stanford (California), with beers all 'round, listening to Frank Mittelbach and Chris Rowley talking about the need to “do something” about all these packages. And Sebastian Rahtz, I think, had already been trying to organise something around that time as well. It just took a while to coalesce. The current era seems to be one of great stability: TeX and LaTeX itself are now firmly settled (largely due to the efforts of the LaTeX3 team) with refinements to packages, ever-improving installation via the TeX Live CDs, better package documentation (the .dtx\.ins method of writing/documenting macros has given a tremendous boost to both the macro writer(s) and the end user, in terms of flexibility in both upgrading, and usability). We're coasting, in a sense. But that's not meant in a negative way. We've perhaps become exhausted with the variables in installation on different platforms, and just want to use TeX, for God's sake! Keep the main TeX tool(s) running smoothly, and plugging away at improving and streamlining the components that go into a full and proper installation. It all works right now — please don't make it hard again! ;-). And so, perhaps at present, we don't seem to have a driving force, because maybe it's not clear just where we need to go next. Of course, since I don't read texhax anymore, I may simply be loitering in an eddy on the side, unaware of the currents which are moving right over there, to the left or right of my little puddle ;-). Which is why it's good to keep adding interviews to this collection! DW: What do you see as the significant components of the TeX community? What do you see as the strengths and weaknesses of the TeX community? CTAN: the stats on this are probably stupendous, in comparison with other archives of computer software. I think these should be lauded more than they are — and papers given/published in computer software arenas where TeX is “just another program”, to raise awareness of what's been quietly brewing all this time. The user community and its philosophy, if you wish, of helping out, volunteering, contributing, sharing. We see it time and again, when someone (again, either a new user, or a user new to a package or application need) posts a query, gets not only a couple of answers but probably also a pretty detailed explanation of why it's like that — all in the space of a few hours or days. Free. And it's advice that will work for any implementation. If the query's about TeX, then it's irrelevant if it's on a Linux or Unix box, PC or Mac. Of course there are system-specific issues on occasion, but if it's strictly about TeX, then it's not only an answer for that person but for every other TeX user out there. TeX is TeX, no matter what machine you're on. And that's pretty darn wonderful. the on-going installation hassles — until we get a product that installs like everything else on PCs and Unix and Linux and so on, we won't make inroads with TeX into the non-user community. Potential end users are now rarely computer-savvy enough to “roll their own”; less and less often are the end users the installers; sys-admin types (the “installers”) don't want to mess with TeX because it's so idiosyncratic in installation — the fonts issue is even more sordid! Give them a TeX install routine that mimics what other packages need in terms of installation routines, and TeX could make significant inroads into a lot of these systems. Keep pretending that the end user and the installer are the same, and it won't get used. Keep pretending that the installer just needs to “Read The Fine ;-) Manual”, and it won't get installed. The increasingly pervasive attitude that “beautiful documents” just don't matter — when people don't care about that, they won't give a damn about TeX. So stop preaching beauty and move on to sheer strength and power to do anything that needs “real typesetting”! In short, TeX's beauty is lost on so many people these days, so refocus the promo a bit. DW: I don't know much about the different application areas of TeX users. Of course, I know that lots of people whose writing includes math use TeX. I myself use TeX to write about management and about technology history, but I don't know anyone else who does that, although I suppose there may be others. Are there a lot of linguistics and humanities people using TeX; do they form any sort of TeX user community? CT: I think there are a ton of humanities applications in progress right now; probably have been all along. Dictionary projects date back already to the late 1980s! Linguistics, obviously ;-), has been around, in use by both authors and publishers. All the materials I do is in TeX, so that's a lot of books (many of them critical editions) and journals (I've been doing CJL since 1984) over the past 20 years. And all through that time, I've run into people (in person or via e-mail) who've been doing similar, very non-math/science typesetting. In some ways, we're typically humanities types: we don't group together much ;-). But we're to be found everywhere, and in the most unexpected places. Music! Now there's a great application that is pretty darn stunning. Lots of work done there by the late Daniel Taupin, who's just one of many who find this “normal”. Critical editions, I've mentioned. And there are hundreds and hundreds of books out there (probably thousands or more, eh?) which have quietly been set with TeX. I do try to put a colophon into the backs of books I do, to identify them as having been done with TeX, but sometimes the page is sacrificed for economic reasons. So, in some ways, using TeX isn't the point for publishers — the point is simply to get the job done well. And where once we perhaps loudly proclaimed that this or that project had been done with TeX, for some it's become such a given that it's not necessary to “justify” one's use of TeX — “it gets the job done, and that's all we need to know, thank you”. And now that we can get .pdf output, there's no need to worry about not being in the MS Word world in order to participate in it. Mercifully! DW: Do you have an image of how the TeX world needs to evolve going forward? CT: This sort of follows from what I wrote above (in the question and answer about the `eras' of TeX), about the present phase we're in — at least, from what I can tell. Maybe now is the time for us to look at presenting and packaging TeX in a way that makes it more appealing to the non-user, the commercial software user. Will we ever get to a single installation procedure which is not rife with options (often based on available disc space, or what one thinks is “all” one needs)? Will we ever get to a simple font interface for automatic installation of all the bits in all the right places? Will we ever get to an installation procedure which does not require the installer (who's not the end user in most places) to know anything about TeX (or the end user to know anything about systems)? Where the installation routine is that of any other software for any given platform? We've been serving ourselves and our own needs for a very long time — our favourite program does just about everything we'd like. So, it's pretty hard to get all worked up and excited about such seemingly mundane chores which are basically housekeeping! Putting pretty paper around the toy ;-). Computer use is ubiquitous; however, the time needed to invest in a steep learning curve is not. And as we're the ones who know TeX, we're pretty much the only ones who'll ever be able to map its intricacies onto the non-TeX maps which the rest of the world is now quite familiar and content with. That is, instead of trying to shoe-horn non-users into “The TeX Way” ;-), maybe we should see just how cleverly we can pour TeX into other molds. I think that is a great challenge. Make it quick and easy — and complete! — and then try to get it installed on all PCs sold by … well, whoever you want to target! ;-). DW: Is there anything you wish to ask me? CT: How did you learn about TeX? What's been the hardest thing to unlearn, as it were, based on your own experiences with computers and software? DW: Before Word, I used command-based word processing systems. A few years ago, in reaction to too many new releases of Word which changed how one used it or its file structure, I decided to try never again to write a big document using Word (although I still use Word daily for some sorts of documents). I had heard about TeX, I knew of and admired Knuth, and so I decided to write a book I had committed to write using TeX, although I soon adopted LaTeX. The most bothersome thing about using LaTeX has been something you emphasized — the complicated and fussy nature of installation and updates. Even though I have a software development background, when I am writing I want the system to just load and run without me having to think about configuration issues. Making up the words and trying to make them look good on the page is already more than enough work for me. DW: Is there anything else you would like to say? CT: Don't think so … your questions have provoked a lot of writing ;-) and some pleasant strolls through memory lane — not to mention my old TUGboats, old e-mail, TUG paperwork, and so on! Thanks for the opportunity. But one thing I'd like to ask is that any corrections to my recollections be added to the end of this interview text. And I hope that people who were involved in the early development of TeX tools can find a way to add their memories to these interviews. DW: Thank you, Christina, for taking the time to participate in this interview and for digging into your archives. I've learned much about a part of the TeX world I knew nothing about, and it is fascinating.